Posts: 139 I need an opinion on replacing my radatior or rebuilding the one that is in my 82. the seams are pretty shot and its starting to leak pretty bad. Would it actually be worth it to rebuild it or just upgrade to an aluminum (sp) 3 to 4 row new one? 1972 LT-1 convertible with factory air. Posts: 958 Was it doing a good job keeping your car temp in range before it went bad? If so, then just get it overhauled. You can't go wrong with a new aluminum radiator, but it will cost more too. Posts: 139 yes it keeps the car at 150 according to the gauge. Im Moving to Phoenix at the end of this summer so im not sure how that "dry heat" is going to effect the car. instead of doing it right--- BUBBA STRIKES when you least expect it. 1981 Blue Ice Met. w/pearl ghost flames TKO500 5speed. LS1 Swap 3.45 Dana 44. Posts: 2378 Save yourself some coin and have it recored. My local radiator shop said the copper brass radiators are actually better than the fancy aluminum ones overall. They recored mine about 13 years ago. It kept the car just below the 200 degree mark in hot weather. This year I had the same shop check it over, straighten the fins out and modify the upper outlet for my LS1 conversion. They assured me I would have no problems for many years and many miles with this radiator. But if you want the bling factor, go aluminum. 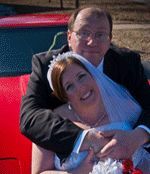 Click here to see more pics of my Vette on CarDomain. Posts: 958 An alumimum radiator will cool 30% better, i.e. 30% more BTUs. A copper radiator is probably better at resisting corrosion. I would have kept the copper and brass radiator in my LT-1 w/ a/c if it would have cooled worth a damn. Sarge81 said: Save yourself some coin and have it recored. No im not interested in the "bling" I just want it to run cool. to recore they said 350.00 if it needs it. I will probibly have the shop look at it pressure test it and go from their. I just didnt need it to go down right now. then again its better now than on a 12 hour trip to Arizona. to my understanding the leaking one in the car is original. (but i was told a lot about the car that turned out to be very incorrect) Im not sure how to tell to be honest. I know its done a really good job at keeping the car cool, with the clutch fan on the motor and the electric 18 inch fan mounted to the radiator she runs at close to 150 or lower most of the time except for limping it home today it hit 200 and that is the hottest the gauge has ever read since i have owned it. I do have the full Ac unit still on the car- needs recharged but it works. i will look for an external condenser as well. Posts: 2378 I agree with Gary. The aluminum will dissipate heat faster. That is the one big plus of aluminum. If you've had good luck with the stock one and you don't necessarily want the bling factor, fix what you have imo. That factory electric auxiliary fan mounted up in the shroud was originally set to kick on at 238 degrees. Mid America made a kit with a fan switch set to kick on sooner. I found a switch and pigtail at NAPA years ago to kick the fan on if it hit 215 degrees. If you've heard your fan kick on during normal operating temperatures, chances are the PO might have put a different fan switch in to help keep it cool. Make sure your shroud/radiator foam rubber seals are in good shape. Without them your car could wind up running a little hotter than normal. Dr. Rebuild has some of the best rubber goods out there imo. Posts: 958 150 degrees? I think you mean 180. That tick on the gauge between 100 and 210 is where my needle sits with a 180* thermostat. F4Gary said: 150 degrees? I think you mean 180. That tick on the gauge between 100 and 210 is where my needle sits with a 180* thermostat. I took the radiator out today. I inspected it- the radiator caps are an inch bigger than the radiator itself. first time ive seen this type of set up. anyways, both side caps are bubbafied, and it looks like the top has been wielded at some point. the top inlet/outlet pipe is cracked pretty bad it broke even more when i was twisting the hose off. looking at the rust inside the radiator, a good restore may or may not do any good but im not sure. I ordered an aluminum one due to arrive early this week and am going to keep the old one until i can find a good radiator shop to restore it. so any ideas on flushing the system? or just wait until i get the other radiator in? Posts: 958 If your car was running at 180 degrees, you didn't have a 195 degree thermostat. Posts: 239 With the rad out I've just run the garden hose into the manifold water neck and cranked it up. Pull the thermo first....you can try running both ways, put the hose into the water pump opening and blast the other way...might float some crap out wedged up in there. Makes a mess if you have rust....don't do it on a concrete driveway. No point in buying a rust dissolver (flush kit) since you cannot let it sit in the engine without the rad. My Christmas present to ME! Bought Sat 11-30-2013. 72, 350 4 spd, Silver with blue interior...Can't you just hear Pablo Cruz playing in the background? 1982 C3 Collectors Edition 44000 miles, sat in the sun most of it's life, My wife purchased it for me for fathers day in 2007 from her girl friend that had it for 19 years. It is on the road again. I'm retired but it is now my daily driver. You are running a crossfire system it is set up to run above 170 normally or the car may not go into close loop. This change occurs between 170 and 175 normally. A crossfire will run great at around 200 degrees I have the stock 195 thermostat in it. I did have my radiator rebuild and had another core put in it. I believe I went from 3 to 4 core radiator. It may have been 2 to 3 cores. I do not know except I told them to purchase a thicker core than came out of it. Anyway that gave it lots of cooling power it runs between 195 and 205 (as measured with a temperature gun on the upper radiator hose) I have a 195 thermostat in it. I always was told it is excessive heat that causes you issues not running at designed temperature. Most car engines are designed to run around 190 to 205 degrees with 215 -220 getting in the little to warm range. If I'm wrong please let me know. If you want it to run cooler run a 165 Thermostat that should do the job. Stay with the brass and copper radiator in my book with 4 cores. Posts: 139 I will eventually get my brass radiator restored. but i couldnt afford the cost on that, the aluminum one is just a temporay. my radiator needs a lot of work to be usable again. it looks like a 1 to 2 core, looks very small for the 350 motor. 1972 conv, 4-speed, 350, 200hp, numbers match, rally wheels, war bonnett yellow w/white top. good condition, nice driver. Posts: 1977 Cindy, I have an old one I can measure. The rads SHOULD be the same auto or standard. The auto has the internal cooler for trans lines. Standard does not. I believe they are interchangeable. Standard won't work in auto, as the cooler is absent, but auto will work in standard. Just have to plug lines, for water and dirt contamination. 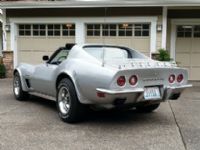 1973 L82 4 Speed Coupe - Very original, well documented driver/survivor. 2016 Bend Regional NCRS Top Flight. Cindy, here are some dimensions from my original ‘73 radiator. My car is a four speed so I do not have any connections for the AT cooler lines. Overal size measured to the outside of the end tanks, not including inlet/outlet pipes 32” x 19” x 3 1/2”. Core only dimensions, not inlcluding end tanks 28” x 18” x 2 1/2”. Hope this helps.. According to the vendors I can find, the same size radiator is used 73 to early 76. Let me know if you have any questions or need any further information. Duct tape is the new Black !! Posts: 405 Cindy, you’ve probably got some wiggle room on the outside width dimension including the tanks. The critical dimension should be the 28” dimension I provided at the core. If you check the brackets at the bottom of your core support, that’s where the radiator is held into the core support. There should also be two brackets that bolt on to the top of the core support. The dimension between should match up with the brackets on the bottom. The dimensions between those four brackets, width, height and thickness are critical to how your new radiator with mount into your existing core support. Not sure what the Canadian pricing would be like including shipping, but I highly recommend Dewitt’s aluminum radiators. I ordered mine in their refinished “Black Ice” set up for a four speed, no cooling fittings to be plugged. Fit perfectly and it’s been running great for the last four years. Good luck ! !